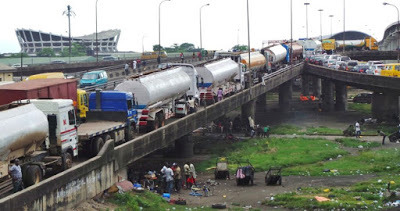 Truck drivers get 48hrs to vacate Lagos bridges – Royal Times of Nigeria. Truck drivers on Wednesday got a 48 hours deadline to clear off Lagos bridges. In attendance at the meeting were the Flag Officer Commanding (FOC) WNC, Rear Admiral Slyvanus Abbah; Permanent Secretary (PS), Lagos State Ministry of Transport, Dr. Taiwo Salau; Commander, 9 Brigade, Nigerian Army (NA), Brig.-Gen. Adiku Attu; Base Commander, Nigerian Air Force (NAF), and Air Commodore Mike Olatunji. Flag Officer Commanding (FOC) WNC, Rear Admiral Slyvanus Abbah said, “We cannot continue like this. This gridlock from Apapa to Mile Two and then from the stadium up to Eko Bridge does not do anyone good. “We are going through trying times in the country and the mere presence of these tankers and trucks on our bridges constitute easy targets for terrorists. No one knows where and when terrorists strike from. Their actions cannot be predicted and that is the more reason why we cannot continue to have these vehicles parked on the bridges for two to three weeks. “The navy deployed its helicopters on Monday to take aerial footages of the situation and I can tell you it is very worrisome. So many people have lost their lives as a result of this traffic. These bridges were constructed in the early the 1970s to carry moving weights not for static vehicles. The bridges have since carried more than the weight they were built for. Parking trucks on them could lead to collapse because they weaken the bridges”.